Now that the Bee is a big kid who goes to preschool every morning, I have been enjoying some time alone with the Bean. I love my quiet mornings with her. Some mornings we do errands, which seem amazingly easier with just one child in tow. Some morning we go fun places and some mornings we stay home and play. For our stay home and play mornings I have been trying to come up with some fun projects just for her. She recently discovered collage and it has become her new favorite thing to do. Mostly because she really, really likes the glue. I am sure she is not alone, what two year old doesn't like to glue. 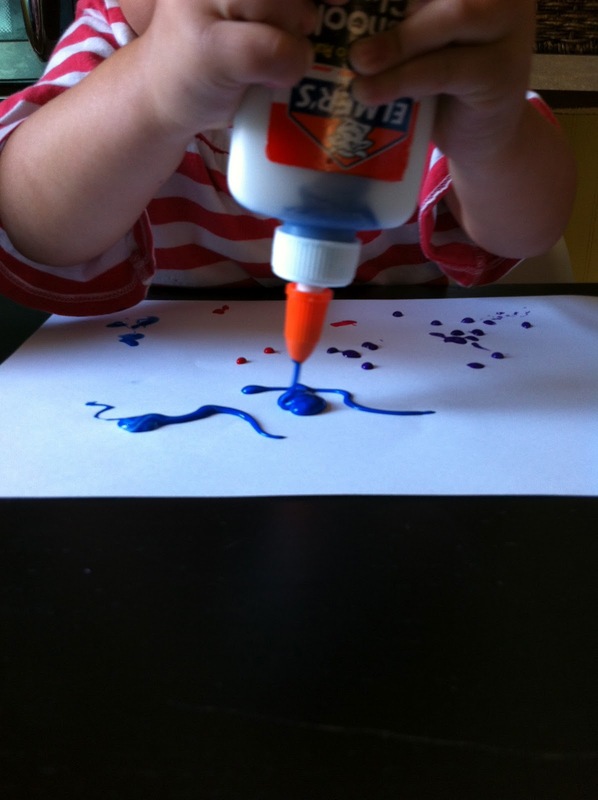 So I thought it might be fun for her to make some artwork that was all about the glue! A few weeks ago, when all the back-to-school supplies were on mega clearance I bought 5 small bottles of Elmers Glue. I took each cap off the glue bottles (on several of them I had to pour a little glue out so it wouldn't overflow) and added several squirts of tempera paints to each bottle. I then mixed the paint into the glue with the end of a paintbrush, you can also shake for a long time to mix it. Once the glue and paint had been mostly mixed I opened all the bottles for the Bean and gave her a sheet of paper. She loved just squeezing the glue all over the paper, especially with all the bright colors. She made several paintings, which when they dried had a cool shiny look to them. When I taught art I used to do a project with my students where we made black glue and went over the lines of a drawing with the black glue. We then would paint the space in between with watercolors to make a cool stained glass effect. I was thinking I might see if the Bean wants to explore painting with watercolors over her glue paintings once they have dried. If she does I will most definitely share the results.